This cabinet card of a Comanche man was made in Indian Territory in the late 1870s by William P. Bliss. 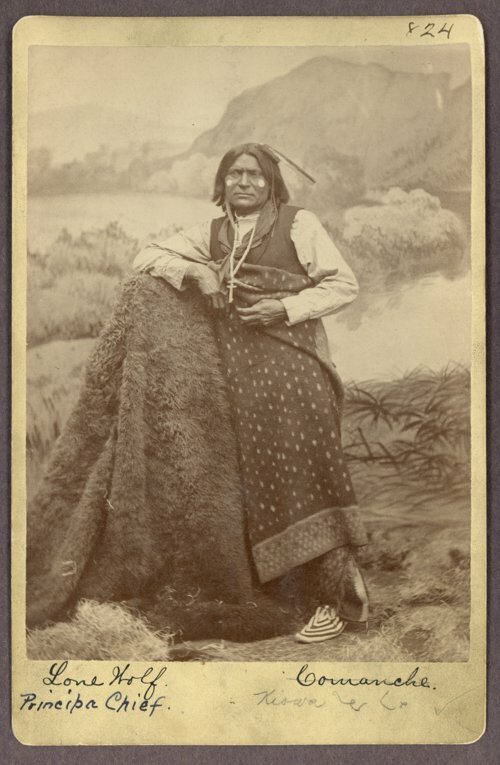 The cabinet card has a notation identifying the subject as a Comanche chief named Lone Wolf, but this is likely an error. Another example of the same photograph identifies the subject as being a Comanche named Wild Horse. William Bliss was a photographer in the 1860s, 1870s and perhaps 1880s who is known to have worked in Kansas, Indian Territory, and New Mexico. Following his discharge from the Army, Bliss opened a photographic business in Topeka in 1864 or 1865. By 1870, he had moved his family to the Wichita area, where he both farmed and worked as a photographer. From there, he went to Indian Territory, first to the Cheyenne Agency at Darlington in late 1874 or early 1875, and soon thereafter to Fort Sill. By 1878 or 1879 Bliss had moved to Santa Fe, New Mexico. This cabinet card was an early donation to the Historical Society. Its accession date of March 29, 1878, means the photograph was likely made in the 1875-1877 period. The cabinet card carries no photographer's imprint, but the accession information attributes it to Bliss, as does the other known example of the same image.